Fast-forward one year to a cold afternoon in November 1978. Utah (5-6), who has lost 6-straight games to BYU, again finds themselves losing to the Coogs (7-2) by as many as 16 points. Under these circumstances, the Utes pulled together and pulled off one of their most memorable Holy War victories ever, and their last until 1988. Howard's statements from 1977 were vindicated, and truly foretold the future of the Utah-BYU rivalry. 2007 RANKING: #20. This one gets points for being a rivalry game. A late-game come-from-behind upset victory. It was also one of the few bright spots in an otherwise dreary era of Utah Football now known as "The Dark Ages." Finally, it had that legendary TD pass from Randy Gomez to Frank Henry in the southwest corner of the north endzone, followed by a heroic defensive stand to preserve the Ute win. I believe that since this was the only win over BYU from 1972-1987, this game is more significant than the other Utah-BYU games highlighted so far. Still, it was a lone win in an era of mediocrity. Instead of being a catalist for improvement, the coaching carousel continued, and so did "The Dark Ages." The team that wouldn't be beaten couldn't be beaten Saturday afternoon. The Utah football team, trailing 16-0 and 22-7 in the third quarter, shut down the BYU offense and struck twice with touchdown passes in the fourth quarter to defeat the WAC champions, 23-22, in a cardiac caper which left 29,326 emotionally drained. It was the first victory for the Utes in seven starts against BYU. The last victory came in 1971, but there was no tarnish on the triumph as Utah gave BYU the early lead on mistakes. BYU picked up 16 of its points after Utah turnovers, with an intercepted pass setting up a touchdown pass, a fumble recovery setting up a field goal and an intercepted pass being returned for a touchdown. Utah scored two touchdowns after recovering fumbles. In a game as bitterly fought defensively as this one was, it's hard to pinpoint the turning point. But a key set of turnovers will do for a turn-around. Trailing 22-17, Utah was driving with a first down on the BYU 20 with 5:34 to play. But the blitz drove the Ute quarterback, Randy Gomez, out of the pocket and in his scramble, he was stripped of the ball. But Bill Ring fumbled back with Jeff Griffin recovering on the BYU 27 for the Utes. Gomez, on fourth and 15, pitched perfectly to Frank Henry in the coffin corner for the 19-yard score that gave the Utes the lead for the first time all afternoon. Utah also made a big play when Gomez, facing a second and 31 situation, hit Tony Lindsay on the fly, and the little tailback scooted 42 yards for the score which closed the margin to 22-17. But the main heroes were the defensive players, who held BYU to just four yards total offense in the fourth quarter, including a 20-yard pass completion late in the game. So effective did the Ute defense react that BYU, after gaining 220 yards total offense in the first half, was shut down with 88 yards total offense the last 30 minutes. Meantime, the Ute offense came alive in the second half and added 273 yards to the first half 174 total. Utah had a 447-308 bulge in total offense and the Utes, led by Lindsay, rushed for 182 yards against a Cougar defense which is very good against the rush. Lindsay carried the ball 30 times for 104 net yards, almost twice as many as the BYU running attack netted with 59 yards. The Ute defense, constantly attacking quarterback Jim McMahon, bit the Cougars for 76 yards in rushing losses. McMahon, under the best pass rush a Utah team has shown in years, completed 15 of 38 for 249 yards and one touchdown while Gomez completed 20 of 32 for 265 yards and three touchdowns. Perhaps the final difference lay in the fact Utah could run the ball and offer a balanced offense while Utah's defense wouldn't let BYU establish much of a ground game. It didn't start out that way as BYU struck suddenly and caught the Utes in a gambling defense which allowed McMahon to scamper on the quarterback draw 56 yards on a third and 25 situation. Forrest Henry saved the touchdown and eventually Brent Johnson kicked BYU into a 3-0 lead with a 20-yard field goal. 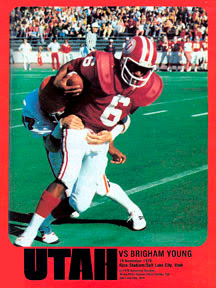 Rod Wood intercepted a Gomez pass at midfield and returned it to the Utah 37 and with third and 13, Lloyd Jones beat the Ute secondary for a 37-yard touchdown pass from McMahon. Johnson's kick made it 10-0, but Utah got a little tougher and that was the score at the end of the quarter. Utah's Jeff Hucko missed on a 44-yard field goal try and BYU came right back with a field goal of 52 yards by Johnson. This could have been a key play, had the Cougars held on to win, because the Utes had the option of taking a 15-yard penalty or using up the down. Utah turned down the penalty and Johnson hit from the 42. Coach Wayne Howard took full blame, adding "the defense wanted me to take the penalty, but I didn't think he could hit a 52-yarder and if he missed, we had the ball almost at midfield. If we set them back 15 on the penalty, they would punt us into the hole. So I guessed wrong." Utah guessed right later in the game though, when the strategy dictated that Hucko try a 37-yarder on the first play of the fourth quarter when the Utes trailed, 22-7, with the ball on the 20. "I'm not sure yet if that was the right percentage, but those three points won the ball game," Howard laughed. But before that point, Johnson had kicked a third field goal, this one of 21 yards after the Cats had recovered a Utah fumble. That kick made it 16-0 at the half. Jeff Lydal recovered a fumble for the Utes early in the third quarter and the Utes put together the best drive of the game, 78 yards, with the final 25 coming on a Gomez to Jim Teahan pass. Utah apparently had the momentum, but it switched as Dave Francis intercepted a deflected Gomez pass and returned it 20 yards for the score that made it 22-7 at the end of the third quarter. Then came the Hucko field goal and the touchdown passes from Gomez to Lindsay and Gomez to Henry. But there was still 2:13 to play, and that may have been the longest two minutes in the lifetime of a lot of Utah football fans. BYU had two series of downs to get within field goal range, but that Ute defense would not give ground. McMahon got one 20-yard pass to Kent Tingey. But when the game ended, BYU was on its 40-yard line. Howard was subdued, but living on cloud nine after the game. "In my 22 years of coaching there may have been two other victories more rewarding," he mused. "But considering the caliber of the opposition, this has to be the biggest one." "Today we proved we can win against a good team, and make no bones about it, BYU was a good team, a very smart defensive team. We got some big plays in the second half and the defense has played super most of the year." "We did nothing coaching-wise; the players did it. We just stuck with what we thought would work, even when we were behind 16-0. We did some gambling on defense, and BYU was quick to pick it up." "That's the mark of a smart team, to pick it up that quickly and that quarterback draw forced us to change that quickly." It was a game the Utes will cherish for a long time, maybe even more than the 28-27 victory over Arizona in 1972 when the Utes trailed 27-0 in the fourth quarter. For the Cougars, the defeat meant nothing since the conference race had been clinched a week earlier. But the defeat ruined a chance for an all-winning WAC year, as well as a chance for a record 10-win season. Utah's second-half mastery was shown in the first downs. At the half, with BYU leading 16-0, the Cougars had eight first downs to Utah's nine. But at the end of the game, BYU had only 12 first downs to Utah's 25. BYU picked up only two first downs rushing, eight passing and two on penalties while Utah balanced out with 12 rushing and 12 passing and one on a penalty. Offensively, fullback Mike Moseley also enjoyed a fruitful afternoon for the Utes. Moseley picked up 58 yards in nine carries, which forced the Cougars to respect the Ute running game. In addition to his 104 yards rushing, Lindsay caught one Gomez pass for 42 yards, giving the 5-foot-8 tailback 146 total yards for the game. Meanwhile, the swarming Ute defense limited BYU tailback Casey Wingard to three yards on four carries. McMahon, who was dropped for several losses, netted 12 yards on the ground. Defensively, it was a team effort with Jeff Griffin, James Wilson, Derek Washington, Tony Reed, Jeff Lyall, Guy Morrell and Mike Bailey leading the way. With Utah having the ball 89 plays against the Cougars' 66, BYU had more impressive defensive statistics. Davis Francis, Ron Velasco, Jason Coloma, Bill Schoepflin, Rod Wood, Glen Redd, Doug Stromberg and John Kormylo were the Cougars who gave ground grudgingly to the Utes in the second-half showdown. In addition to Lindsay, Utah got good running from Mike Moseley and the defense held the dangerous Cougar receivers, Mike Chronister and Tod Thompson, to two catches each. But Saturday, the better team won because it wouldn't give up when it's own mistakes were killing it. Howard coached successfully in California JUCO's for many years after he left Utah. He did not retire from coaching in 1981. I never understood why he never got another shot at a D-1 job. Forrest Henry caught Jim McMahon with 248 left in the 4 Th quarter. He was 30 yards behind him. If he does not catch him game over. BYU wins Again. Watch the film John moobey.